Cryptocurrencies: love them, hate them, or be baffled by them, but don’t think you can escape them. That’s the way it seems these days at least, with news media filled with breathless stories about Bitcoin and the other cryptocurrencies, and everyone from Amazon to content creators on YouTube now accepting the digital currency for payments. And now, almost everyone on the planet is literally bathed in Bitcoin, or at least the distributed ledger that makes it work, thanks to a new network that streams the Bitcoin blockchain over a constellation of geosynchronous satellites. In the radio business, getting the high ground is key to covering as much territory from as few installations as possible. Anything that has a high profile, from a big municipal water tank to a roadside billboard to a remote hilltop, will likely be bristling with antennas, and different services compete for the best spots to locate their antennas. Amateur radio clubs will be there too, looking for space to locate their repeaters, which allow hams to use low-power mobile and handheld radios to make contact over a vastly greater range than they could otherwise. Now some hams have claimed the highest of high ground for their repeater: space. For the first time, an amateur radio repeater has gone to space aboard a geosynchronous satellite, giving hams the ability to link up over a third of the globe. It’s a huge development, and while it takes some effort to use this new space-based radio, it’s a game changer in the amateur radio community. With the advent of cheap software defined radios made popular by the RTL-SDR project a few years back, satellite communications are now within the budget of even the most modest hacker. For $20 USD you can get a USB SDR module that is more than capable of receiving signals from any number of geosynchronous satellites, but you’ll need something a little more robust than rabbit ears to pick up a signal broadcast from over 22,000 miles away. Building a satellite-capable antenna isn’t necessarily difficult, but does involve a fair bit of arcane black magic and mathematics to do properly; something that can scare away those new to the hobby. But by using a 3D printed mandrel, [Tysonpower] has come up with a feed you can build and mount on a standard dish without having to take a crash course in antenna theory. [Tysonpower] reports the feed has a center frequency 1550 MHz, and works well for reception of Inmarsat, AERO and HRPT signals. The channel in the 3D printed core of the feed ensures that the inserted wire is of the correct length and in the perfect position for optimal reception. 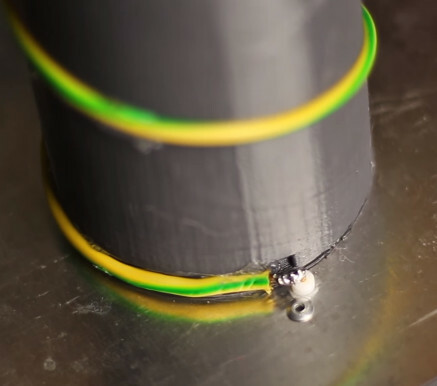 All you need to do is print the core, wrap it with wire, and then solder the end to a connector on a ground-plane that’s nothing more than a sheet of aluminum. [Tysonpower] was even kind enough to model up a mount that will allow you to bolt this feed to a standard satellite dish. We’ve previously covered using RTL-SDR to receive Inmarsat transmissions, and hardware for the Outernet project, both of which would be great applications for an antenna like this. Have you got a spare Dish Network antenna lying about? They’re not too hard to come by, either curbside on bulk waste day or perhaps even on Freecycle. If you can lay hands on one, you might want to try this fun radio telescope build. Now, don’t expect much from [Justin]’s minimalist build. After all, you’ll be starting with a rather small dish and an LNB for the Ku band, so you won’t be doing serious radio astronomy. In fact, the BOM doesn’t include a fancy receiver – just a hacked satellite finder. The idea is to just get a reading of the relative “brightness” of a radio source without trying to demodulate the signal. To that end, the signal driving the piezo buzzer in the sat finder is fed into an Arduino through a preamp. The Arduino also controls stepper motors for the dish’s azimuth and elevation control, which lets it sweep the sky and build up a map of signal intensity. The result is a clear band of bright spots representing the geosynchronous satellites visible from [Justin]’s location in Brazil. Modifications are definitely on the docket for [Justin], including better equipment that will allow him to image the galactic center. There may be some pointers for him in our coverage of a tiny SDR-based radio telescope, or from this custom receiver that can listen to Jupiter.